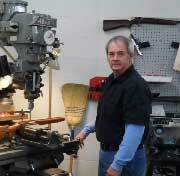 Ray Silver is the Gunsmith at Sportsman Inc.
We also do a full range of service, custom work and rebarreling. Firearm Wood finishing and Firearm Metal Finishing is not done onsite but we do have outside avenues and facilities for firearms finishing. We service and repair all guns that are available here in the store. We service all firearms manufactured today and have repaired firearms that are 100 years old.